KOER REPORT: Bigger, strong, striking stretched, very harmoniously developed, typical. High Withers, firm back, good croup, in front and in the back very well hind, normal chest, correct front. Very beautiful upper and Unterlinie, clean-stepping, are shown ground covering gait with very good supply and free precedence. UCB pronouncedly; discharges. 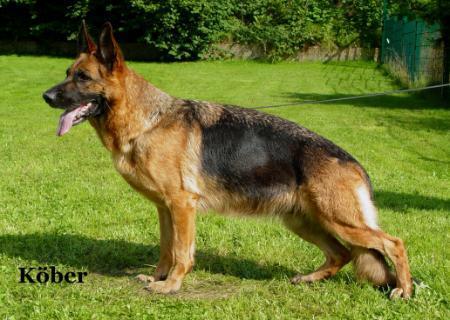 2004 German Sieger Show Report: Bigger, very strong and substantial, very good head and expression, very good upper line, high long Withers, firm back and good length and situation of the croup, very good angulations, clean front, in front somewhat stepping toe-wide, good gait. Breed value 72.